This file will explain you how to set up and use the "DekoPay(Pay4Later)" Magento module. actually its not, you probably just might jump to the options page and explore everything yourself, this file is more of a reference work if you do not know what to do, or if you are not familiar to Magento. Have fun with your new module! DekoPay rebranded from Pay4Later, the UK's leading online retail finance service gateway, makes it easy for finance companies and retailers to work together to offer consumers credit at the point of sales. where user can purchase product according the financial plan they are comfortable & affordable with, after user submitting the credit application at the time of purchase , the lenders will verify the application submitted & immediately respond to application, that provided user is accepted or not. Extract the downloaded magento module. After extracting the module, go to app/code/local , Copy "Sharesoft" folder,which is our module folder, place it in local folder. next, go to app/etc/modules , copy "Sharesoft_Dekopay.xml" file, place it in etc folder. finally, go to app/design/frontend/your theme folder , copy "dekopay" folder. place it in your theme folder. After adding required files and folders, Login into your Magento admin panel. click system -> configuration -> sales tab -> Payment methods -> sharesoft Dekopay(Finance module). Login into your Magento admin panel. Title Provided here will be appearing in the checkout payment information tab. Display the dekopay(pay4later) finance option with the title provided here. Admin can Enable/ disable the module from here. In this option it consist of two options yes/no, when test mode is yes, After checkout user will be redirected to test dekopay(pay4later) credit application(test url). If test mode is no, it will redirecting the user to live url after checkout. Get the api key from the dekopay(pay4later) account. add it in this field. 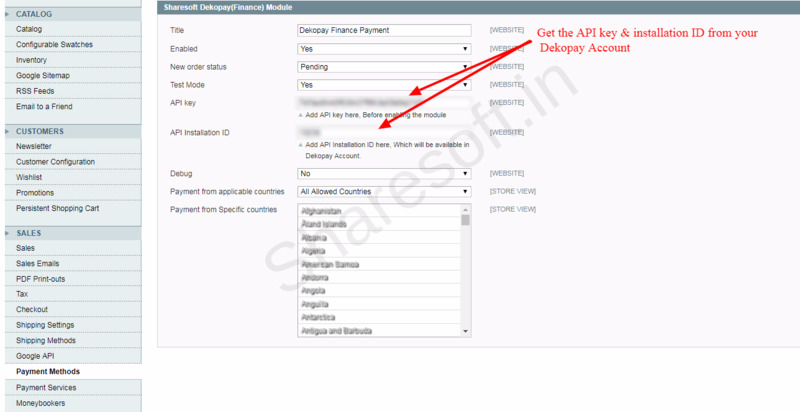 -> Log into Dekopay(Pay4later) Account, In left menu click Integration -> API keys . as shown in below image. Get the api installation Id from the Dekopay(pay4later) account. add it in this field. -> Log into Dekopay(Pay4later) Account, In left menu click Installation, and copy the ID provided in installation ID from the profile . as shown in below image. 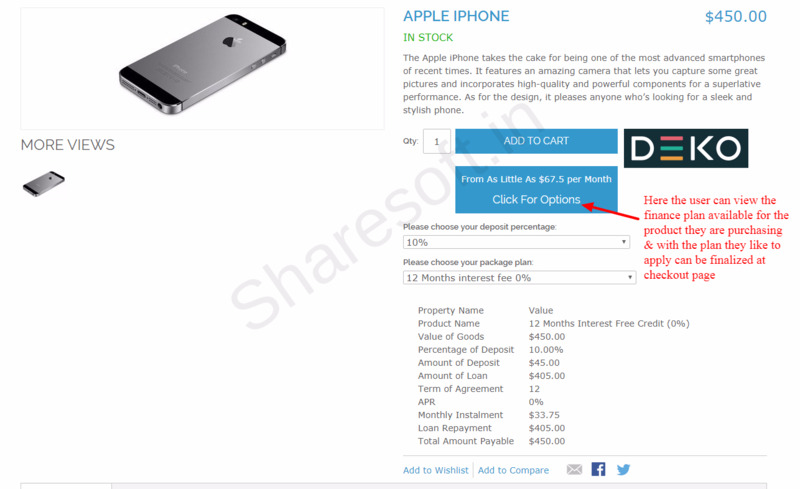 By setting the default percentage & plan code here , calculating financial option to the particular product with defaults will shown in product page. as shown below image. example options applied are for percentage 10 and plan code is ONIF10. Set minimum finance amount here. (i.e. minimum finance amount allowed is 500 ). Note: If the product price is less then the Finance Minimum amount , you can’t use the Finance options to the product. To get the credit application status from dekopay(pay4later) to your site, admin has to enroll the CSN url's in dekopay(pay4later) account. Click Button mentioned in below image. Add CSN notification Email, After credit application is processed credit status notification email will be sent to email id provided. In product page, dekopay(pay4later) has provided as finance calculation tool with its help by passing the required data's it response us with the finance data that is applicable for the respective percentage and plan code & product price. 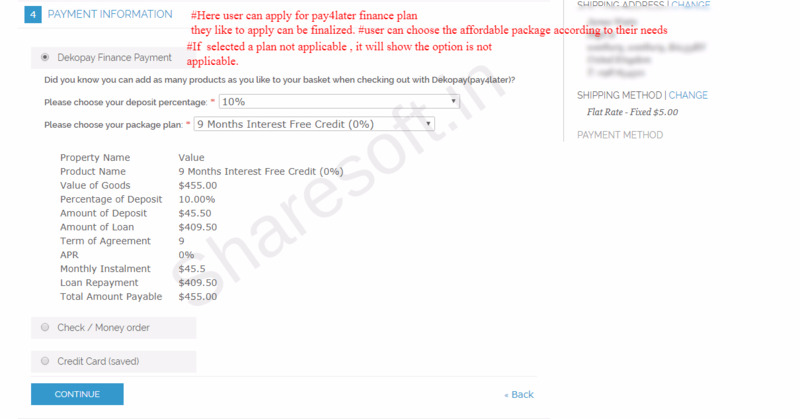 Here User can view & choose the financial plan that is applicable for them. To finalize the plan, in checkout page the finance tool is integrated. Below Image shows, how does the dekopay(pay4later) functionality in product page. In Checkout page , Payment Information Tab finance tool is integrated, where the user can finalize the plan they are interested. In Checkout page, at final step user can view the plan the choosen before proceeding to dekopay(pay4later). After checkout, the user will be redirected to dekopay(pay4later) credit application form , with the products, percentage and plan they have chosen. 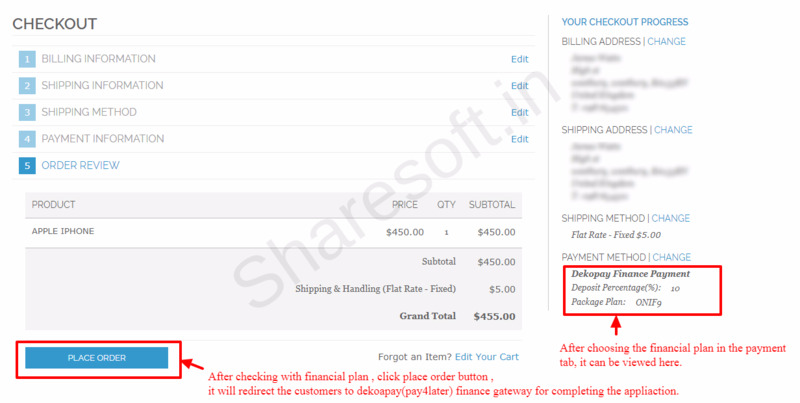 Below Image shows, how does the dekopay(pay4later) functionality in Checkout page , Payment Information Tab. In Credit application form, user will be asked to provide the details that is necessary for the application process. After immediate submission of the form, lenders will verify the application , and provide the notification whether the application is Approved , declined or referred. If Approved, user will be asked to pay the initial deposit they are applicable. After process completed, user will be redirected to our site. Below Image shows, Credit Application form submitted from our site. Once again, thank you so much for purchasing this module. As we said at the beginning, We would be glad to help you, if you have any questions related to this module. No guarantees, but we will do our best to assist.